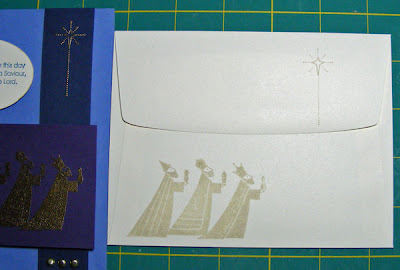 And speaking of envelopes... For the back of the envelopes for this Season of Simple Grace card, I used Ranger's Old Paper distressing ink to stamp the Wise Men and the star images. It gives the envelopes a subtle custom look. Ingredients for envelope: Stamp set: Season of Simple Grace by Stampin' Up! Envelope: Very Vanilla Medium by SU!